3/17/2011Share this story on Facebook! 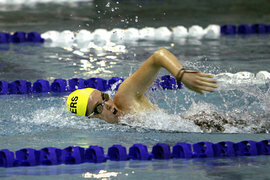 Maddie Kennedy '11 swims the 1650-yard freestyle during the UNYSCSA Championship. The Ithaca College swimming and diving teams dominated pools all over New York State in one of the Bombers’ most impressive seasons ever, with both men’s and women’s teams placing first in the Upper New York State Collegiate Swimming Association and Empire 8 championships. With a massive influx of freshman talent this year— Taylor Van Cott ’14 and Connor White ’14 shared Empire 8 Rookie of the Meet honors—the reenergized men’s squad, led by Jeff Rapp ’12 and Antoine Connors ’12, cruised to a spectacular 15-1 regular season record. Kevin Markwardt was named Coach of the Year. The unstoppable 12-time All-American Sheila Rhoades ’11 (Swimmer of the Meet), Jodi Costello ’12 (Diver of the Meet), Paula Miller (Coach of the Year), and the always-formidable women’s team finished the season undefeated.